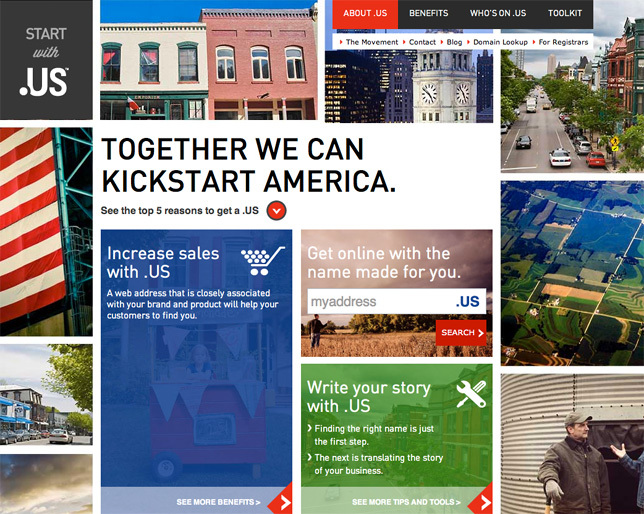 Neustar, Inc. begins a "Kick-start America” campaign for the .US Top-Level Domain. Companies of all sizes — locally-based or doing business in the United States — are encouraged to demonstrate their local presence with "America's Address." According to the company, extensive research was performed over the past several months into determining who made up the .US target market… "They are the people you interact with every day. At least, we hope you do. They are the small businesses who are the backbone of America. They are the second generation hardware store in Memphis, the florist shop in St. Louis, the cupcake shop in Austin, the accountant in Topeka." Kick-start America – Neustar relaunches About.us website and starts extensive branding campaign targeted to consumer target market. Local Time: Saturday, April 20, 2019 12:02 PM PDT – Page Load: 0.2678 Sec.